Aside from its architectural heritage, Vigan City charms tourists with its friendly, warm and hospitable people. One of the places to visit in the city is Calle Crisologo which is fully packed with Spanish-styled homes, owned mostly by affluent Ilocanos. And in lieu with the times, these homes were converted into shops and stores selling Ilocos Sur's trademark delicacies of empanadas (fried minced-meat pies), longganisa (native meat sausage) and antique potteries. Interested visitors can take a ride with the horse-drawn calesas, the Philippine version of the 18th century's calash. 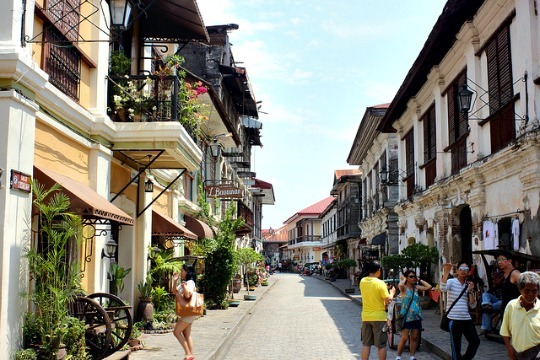 And to demonstrate Vigan's affinity and ties with Europe, Calle means street in Spanish and Venetian. The famous street is named after Marcelino Crisologo, Ilocos Sur's first Filipino governor. The former was also a writer who popularized Ilocano art and literature. A few minutes away from Calle Crisologo is "The Camarinis," a jar factory famous for its "Burnay," earthenware made up of burned clay, which is also called "burnay." The clay, which is abundant in Vigan, is being burned before being molded to make it darker in color than other earthen pots. Burnay pots and jar are solid and airtight, primary used for storage. Old-time Ilocanos believed that basi (sugarcane wine) should be stored in a burnay pot for better taste. Tourists can also experience pottery making free of charge in Pagburnayan, a place where they use old techniques in the manufacture of these jars. The clay used to make burnay jars is a combination of fine sand (anay) and a clay found locally. Carabaos (water buffalo) are allowed to tread the materials repeatedly until it reaches the desired consistency.